On an uncertain date in March 1289, fallen nobleman Ugolino della Gherardesca was immured in a Pisan tower with two sons and two grandsons — all doomed to starve to death and land in the Inferno. Hungry? Ugolino with his starving whelps, as chiseled by Jean-Baptiste Carpeaux. (Ugolino was around 70 at his death, so his sons and grandsons were actually quite a bit older than these tots.) Auguste Rodin also sculpted Ugolino, more literally following Dante’s narrative. In the dangerous Guelph vs. Ghibelline political landscape, Gherardesca had a knack for switching sides. Originally a Ghibelline, he was banished once for plotting but returned with the support of Guelphs, and was made podesta to negotiate with Pisa’s Guelph enemies, Florence and Lucca. Having made the unpopular but perhaps politically necessary decision to buy peace with Florence at the expense of territory and castles, Ugolino schemed to extend his own authority in Pisa, only to find himself hoisted on his own petard when onetime plotting-partner Archbishop Ruggieri Ubaldini had Ugolino and descendants seized for (wait for it) … treachery. Months later, Archbishop Ruggieri ordered the keys to their dungeon thrown into the Arno and left them to starve to death. Ugolino’s fate is mostly remembered by way of Dante, who places both Ugolino and Ruggieri deep in hell — where the treacherous noble has at least the satisfaction of gnawing vengefully on the treacherous cleric, but detaches his maw long enough to deliver himself the poem’s longest speech by any of the damned. Here’s Dante’s Ugolino, from the tail end of Canto XXII through most of Canto XXIII. Than on that skull and on its garbage he. And after murder’d, need is not I tell. That from the future tore the curtain off. Lanfranchi with Sismondi and Gualandi. And if not now, why use thy tears to flow? I look’d upon the visage of my sons. I wept not: so all stone I felt within. We all were silent. Ah, obdurate earth! 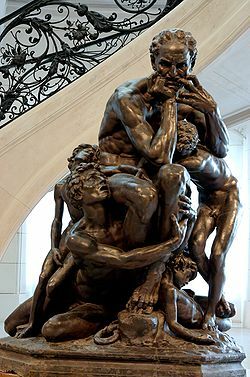 Dante’s quite understandable speculation that Ugolino might have been driven to cannibalize children has been recently disputed by scientists examining the apparent remains of this unfortunate bunch. But it hardly matters now … and Dante was sure right about the cannibalism scene’s dramatic potential.